Five years ago, I had the pleasure of meeting Atlanta based artist Melissa Payne Baker (above) when she was an undiscovered artist. I loved her work then, and have been amazed to see how her art has become better and better through the years, achieving a high level of beauty and sophistication. Melissa has an incredible feel for form and color that puts her in a category all by herself. She is known for her thick texture and incredible brushwork, as well as her ethereal subject matter. I admire all of Melissa’s work, but I am particularly partial to Melissa’s small pieces. They add a little burst of beauty and color to just about any place in the house, and enable the enjoyment of original art in unexpected places. I also appreciate the soothing nature of her paintings – they are a little oasis of peace and calm in an often hectic world! Here is a Melissa Payne Baker painting, as seen in a room designed by Alison Womack Jowers seen in a recent Atlanta Homes & Lifestyles (photo credit: Emily Followill). I love how this little painting of Melissa’s signature angels adds just the right touch to the space. It also reminds me of the childhood bedtime prayer ‘angels guard me through the night, and keep me safe ‘til morning’s light’. Melissa has been a featured artist at the Atlanta Symphony Decorators' Show House 2008-2010, and was voted as Atlanta’s best emerging artist in 2010 by Creative Loafing. Here is a vignette from the 2010 Symphony Show House, expertly arranged by Dillard Design – Melissa’s painting is the square one on the bottom. The view from across the foyer – a peek of Melissa’s painting can be seen. I am pleased to offer a selection of Melissa’s small paintings on the Quatrefoil Design store. All of these pieces show below are one of a kind, original art. Petite Angel in Blue, 6”x6”, acrylic on gallery wrapped canvas, $185. Bird Nest I, 8”x8”, acrylic on gallery wrapped canvas, $245. Bird Nest II, 8”x8”, acrylic on gallery wrapped canvas, $245. Soft Angel I, 10”x10”, acrylic on gallery wrapped canvas, $285. Soft Angel II, 10”x10”, acrylic on gallery wrapped canvas, $285. Bliss I, 8”x8”, acrylic on gallery wrapped canvas, $245. Bliss II, 8”x8”, acrylic on gallery wrapped canvas, $245. Also available (sold individually) – Nest I, II, III, and IV, 6”x6”, acrylic on gallery wrapped canvas, $185 each. We also have a selection of ‘Itty Bitty’ paintings in the store, sized at 2”x2”, priced at $40 each. They can be hung just about anywhere - on bulletin boards, car mirrors, Christmas trees, wine bottles, anywhere you want a little bit of art. 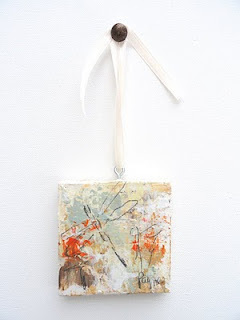 I love the idea of tying one to a present – was a great treat to get a painting as part of a gift! This one is called ‘Itty Bitty III’ (click here for store item: http://www.quatrefoildesign.bigcartel.com/product/melissa-payne-baker-itty-bitty-iii). There are more available on the Quatrefoil Design store - http://www.quatrefoildesign.bigcartel.com. Small pieces of art are incredibly versatile; they can be part of a gallery wall, or be the focal point of a small wall, or hung one on top of another to make a charming vignette. I also like to place a small painting as part of a tablescape or in a bookshelf (as seen above)– paintings help to create a more lively and interesting arrangement. Small paintings on mantels look great too. I hope you like Melissa’s work as much as I do! Please visit (and bookmark) the Quatrefoil Design store for additional paintings. We are adding new things all the time! For more information on Melissa, please see her website. Melissa’s larger paintings are available at Huff Harrington Fine Art in Atlanta. To visit my store, Quatrefoil Design, click here – come see the brand new art and scupture items in the store! maybe that's why homeowners love displaying them in their homes. This is a good thing to do. I like the idea of a a flock of angels in the house, maybe all together, maybe tying rooms together, maybe multiple sizes together. Melissa's work is so lovely and ethereal. Beautiful! What a beautiful talented artist, thank you for sharing. I live in Athens Ga and just came across your blog everything is so beautiful, I will be back often to visit and follow. Have a wonderful Sunday. If you get the time please stop by my blog. I just bought the Angels and if they are anywhere near as beautiful as your photos, I know I will cherish them for a long time. Thank you for showcasing this work. Lovely - ethereal and tactile and loved how you placed them, especially in the book case. These paintings are oustanding and so well priced. Thank you for creating this beautiful post. Loved every photograph ! 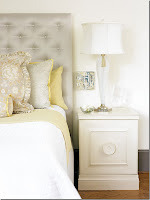 I really love Melissa's use of subtle colors and texture -- very nice! Beautiful artwork - love the pieces featured! Thanks for sharing! Delicate and charming. I love the small sizes. A lovely lady with lovely talents. Thank you for sharing. The birds nests are my favorite! And I love that they are small, like a little surprise. Thank you for telling us about this talented artist. I love the way you placed the small paintings in your bookcase and on your tables. I like to do that also, it adds so much warmth to those spaces. A wonderful introduction and fabulous addtions to your shop! I love that she does work in a vaiety of sizes and subject matter...so appealing. I had to view this beautiful art3 times. I tweeted and sent to Facebook as well. What a talent Melissa has ! Beautiful, love the piantings of the nests. So interesting and beautiful. I love art that makes me analyze it, not just look, but feel it. Post of the Day: A Retired Baseball Player's House. I am so happy about this partnership I can't stand it!!! I had the honour of showing my work beside Melissa at a couple of art shows and I agree her work is stunning! Made me wanna spiffy mine up a bit!!! BTW, doing a painting "giveaway" right now on my blog. But hurry, the contest ends tonight at 6! As always, I just love your blog! I get excited when I get the e-mail saying a new one has come in!!! I love art like this! I wish I had the talent to do this type of work. Been thinking about you...know all is busy! These are absolutely gorgeous pieces. Hard to pick a favorite!